The Intergovernmental Conference (IGC) on an international legally binding instrument (ILBI) under the UN Convention on the Law of the Sea (UNCLOS) on the conservation and sustainable use of marine biodiversity of areas beyond national jurisdiction (ABNJ): The name doesn’t exactly roll off the tongue. It is, however, quite possibly the best chance for the twilight zone—a vast swath of ocean 200-1,000 meters below the surface—to receive international recognition and management. For that reason, WHOI marine policy expert and Ocean Twilight Zone team member Porter Hoagland recently made two trips to the UN to observe the IGC deliberations. In international law, the high seas—anything in the ocean beyond the 200 nautical mile exclusive economic zones or the continental shelves—is open to use by any individual, organization, or country. After decades of piecemeal regulation, nations began the process of negotiating the terms of the UNCLOS in the 1950s. It was envisioned to be a legally binding treaty that would codify regulation of the world ocean and make all nations subject to the same rules. The current law of the sea also attempts to distribute economic gains derived from the high seas more equally, particularly the profits from seafloor mining, an activity that exceeds the technological capacities of many of the world’s less-developed nations. Under Article 82, companies would be charged royalties on revenues generated from high-seas energy and mineral development, and these would be distributed in part to less-developed nations. After decades of hype, however, a hoped-for windfall of revenue from minerals such as seafloor manganese nodules and massive sulfide deposits near hydrothermal vents has yet to appear. Now, attention has turned to the ocean’s vast biological resources, particularly genetic resources that might be used to make marketable products. Yet the problem of unequal capacity among nations remains. That’s where the conference with the 37-word name, sometimes abbreviated as BBNJ for “biodiversity beyond national jurisdictions,” comes in. In particular, Hoagland pointed to concerns over activities by companies such as the German chemical company BASF, the largest chemical producer in the world. Researchers at BASF and elsewhere have begun combing through scientific literature for reports of new genetic sequences from marine organisms and patenting them. 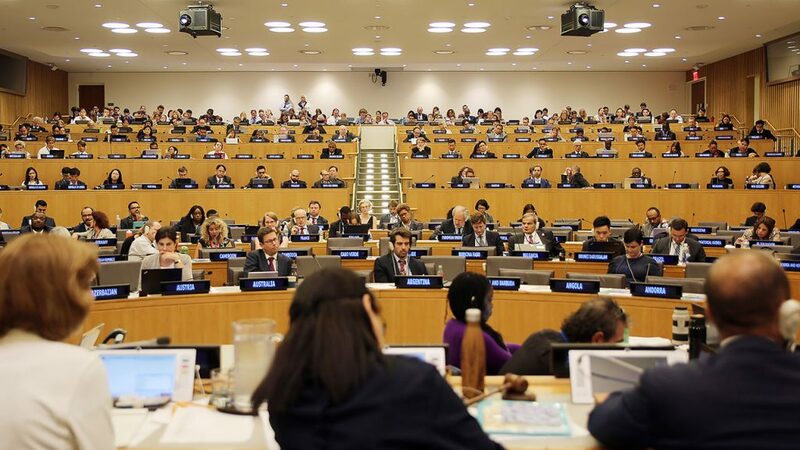 The delegates to the BBNJ conference primarily focused their negotiations on these and other issues as they related to surface waters and the seafloor. 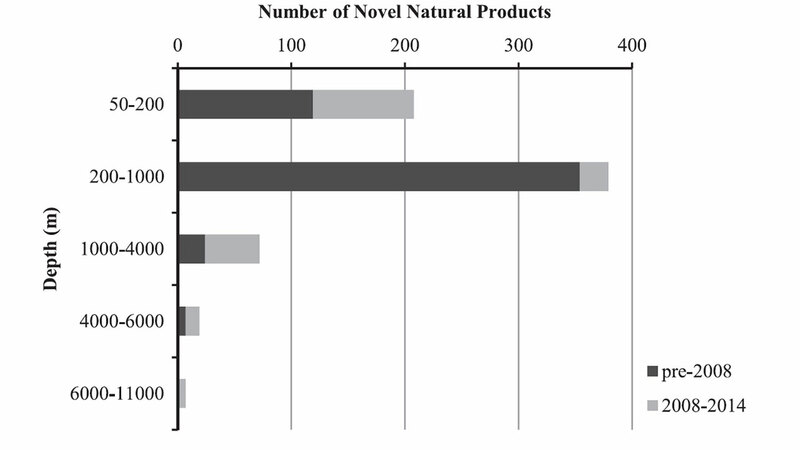 Recent research has shown the distribution with depth of the number of novel natural products derived from marine organisms (left). Before 2008, the number of natural products derived from organisms located in the twilight zone was more than double that of any other part of the ocean, although these were located predominantly in national exclusive economic zones. Since 2008, the number of products from surface waters has risen sharply, but the twilight zone remains the greatest source of natural ocean products—more than in all other parts of the ocean combined. At the same time, interest in seabed mining has not gone away, nor have the problems associated with it. One in particular could impact the twilight zone: what to do with all the extra materials, known in mining terminology as “tailings,” that are brought to the surface along with the mineral ore. Like other discussions at the BBNJ conference, some proposals have focused more on protecting surface fisheries at the expense of deeper down by calling for those tailings to be dumped under the surface waters directly into the lower reaches of the twilight zone.